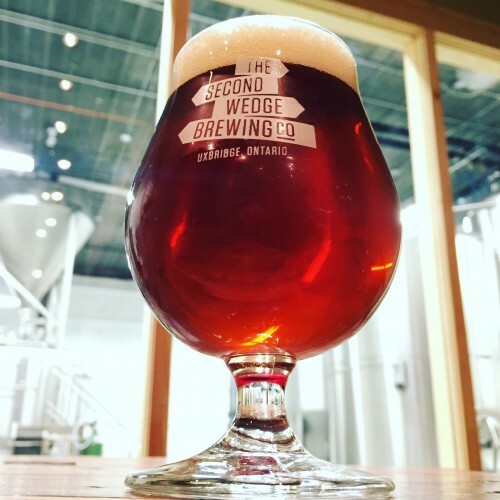 Our Lineup – The Second Wedge Brewing Co. Wheat Beer | 4.9% alc./vol. This twist on the traditional Munich wheat beer has a lightly smoked aroma and a crisp, dry finish from additions of oak-smoked wheat and pale rye malts. Low hop bitterness lets these subtle flavours shine. 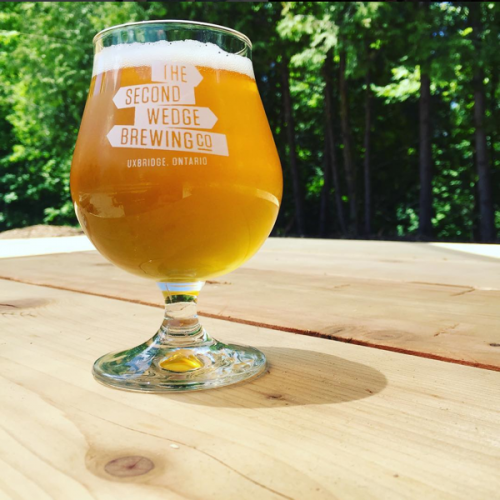 Smoked Wheat on Rye has lingering spice/banana notes, the result of esters produced during its fermentation with weissbier ale yeast. Pairs with smoked fish, potato chips, pickles. Double IPA | 8.5% alc./vol. 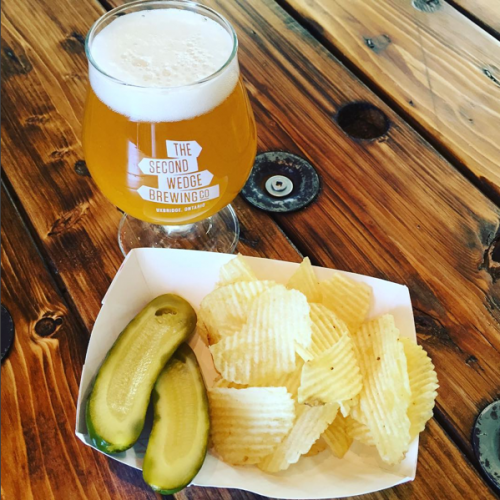 Brewed with 100% Uxbridge hops grown by 6th Hops, Fat Bike is no lightweight beer, but it’s a revelation: a light body with intense citrusy hoppiness makes Fat Bike as refreshing as an 8.5% ABV beer can be. Pairs with carne asada, tandoori chicken, paella, key lime pie. Belgian Dubbel | 7.0% alc./vol. An homage to the rich, dark and intensely fruity dubbel, a style of strong beer that originated in the Trappist abbeys of Belgium. Derailleur has a distinct raisin and dark fruit flavour and aroma from the use of Special B malt as well as candi sugar, a dark, caramelized sugar syrup that is highly fermentable, leaving the beer drier and higher in alcohol, rather than adding sweetness. Pairs with washed-rind cheese, apple spice cake, dark chocolate. Let the grass grow. When we launched High Grass, it became an instant classic in our beer garden, the perfect companion to a sunny day. Brewed with all-natural lemongrass and whole ginger root sliced by hand in our Uxbridge brewery, High Grass brims with freshness and palate-pleasing flavour. Pairs with spring rolls, Thai curry, young brie, mango salsa. Scottish-Style Ale | 4.8% alc./vol. This smooth amber-coloured ale is inspired by Scotland’s 80/- (80 shilling) beer style, priced according to its strength. The star of Monday Night Piper is its deluxe malt bill – best pale malt from England, and caramel and chocolate malts from Germany, add sweetness, rich colour and a tantalizing sponge-toffee flavour, all before finishing dry. Pairs with roast duck, lamb pie, dried fruit and nuts. Bright aroma, rich golden colour and bracing bitterness define 3 Rocks. The key to its drinkability is in the balance of American hops (citrusy Summit, floral Cascade and piney Chinook) and classic Canadian 2-row barley malt, with just enough specialty malts to add fullness and depth of flavour. American ale yeast ferments clean and provides a dry finish. Pairs with wood-fired pizza, hot wings, Italian sausage pasta. American Blonde Ale | 4.5% alc./vol. Easy-drinking blonde ale is known for clear, clean flavours and special attention to high quality malt. German Pilsner malt shines in our beer, providing a bready, biscuity aroma and rich mouthfeel for such a light-bodied, low alcohol beer. Accentuated with citrusy/floral Cascade, Herkules & Saphir hops – just a little more than your everyday blonde’s hop bill, to add some edginess. Pairs with aged cheddar, sushi, classic chicken salad. A deep roast character with loads of dark chocolate and espresso flavour make Rain Maker a rich indulgence. But its alterego is a playful pal to all things barbecue with a refreshing, brisk edge and a dry, never-cloying finish. Rain Maker soothes on blustery days but is at home on every summer dinner table. Pairs with grilled meats, cured ham, steak, dark chocolate. Chocolate stout | 5% alc./vol. When you make beer and your best friends make chocolate, you need to make a chocolate stout. 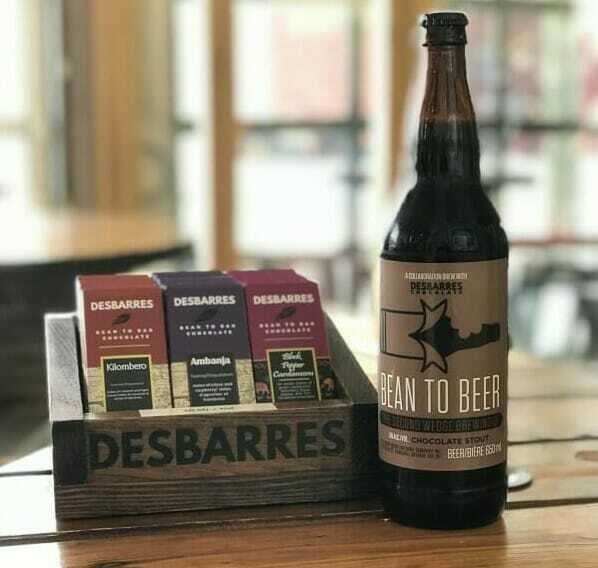 We’re proud to present our collab with Uxbridge’s DesBarres Chocolate, Bean to Beer. Infused with a specially prepared pure dark chocolate emulsion, this beer is smooth and rich with true chocolate flavour and aroma. Pairs with chicken mole, chili, blue cheese. Gruit ale | 5% alc./vol. Inspired by the botanicals in our favourite cocktail spirit, Gin Joint sparkles with a bright and aromatic blend of juniper, angelica root, cassia, orange peel, coriander and cardamom. Makes an excellent beer cocktail mixed 2:1 with tonic water. Garnish with lime. Heather Oat Ale | 4.5% alc./vol. 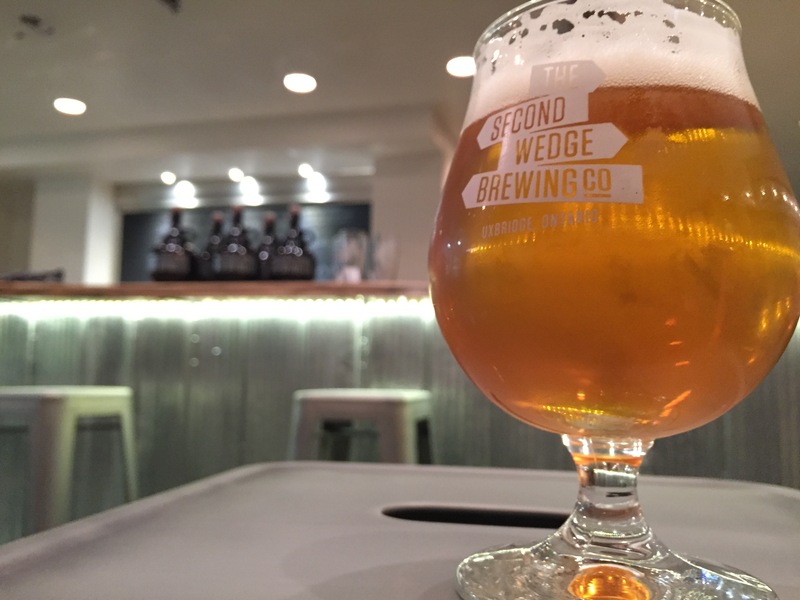 A collaboration with the good people at 5 Paddles Brewing Co., this heather oat ale offers floral and fruity aromas, a light, creamy body and very low bitterness. At 4.5% ABV, this is a highly quaffable beer for a retreat into the shade on a hot summer’s day. Or a paddle down Main Street. 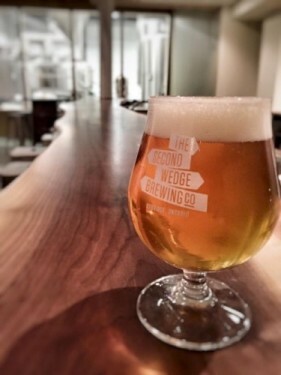 Wet-hopped pale ale | 4.5% alc./vol. Brewed with 100% wet hops harvested at Uxbridge’s 6th Hops Farm, malt from Belleville’s Barn Owl Malt and Escarpment Laboratories yeast from Guelph, our 2018 version of Back Forty reflects this year’s unique growing conditions. Bright, fresh, grassy and piney aromas and flavours mingle with the warm and gently sweet flavours of floor-malted barley. Black IPA | 6.5% alc./vol. This black IPA blends deliciously dark malts with the bright, bold dry-hop flavor and aroma of Centennial hops. Roasted barley adds a nutty, coffee-like complexity and a fluffy tan head. Drinking Witch’s Hat is like taking that darker path into the woods, just for the thrill of it. Pairs with burgers, BBQ ribs, steak, sharp cheese. Dark saison | 5.5% alc./vol. Winter Warmer | 7.5% alc./vol. A rich, warming, spicy strong ale that’s been brewed specially to complement the flavours of the season. 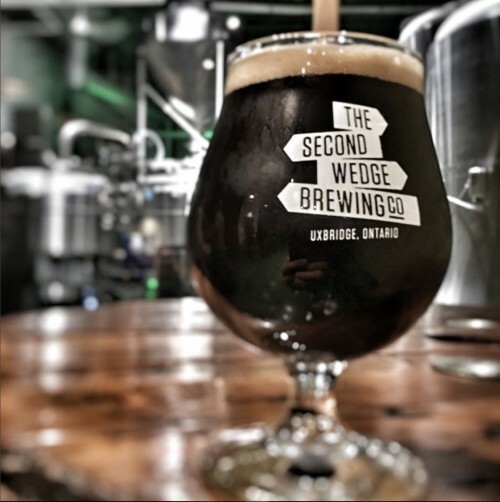 At 7.5% ABV, this is a heady marriage of specialty malts, ginger, nutmeg and allspice. 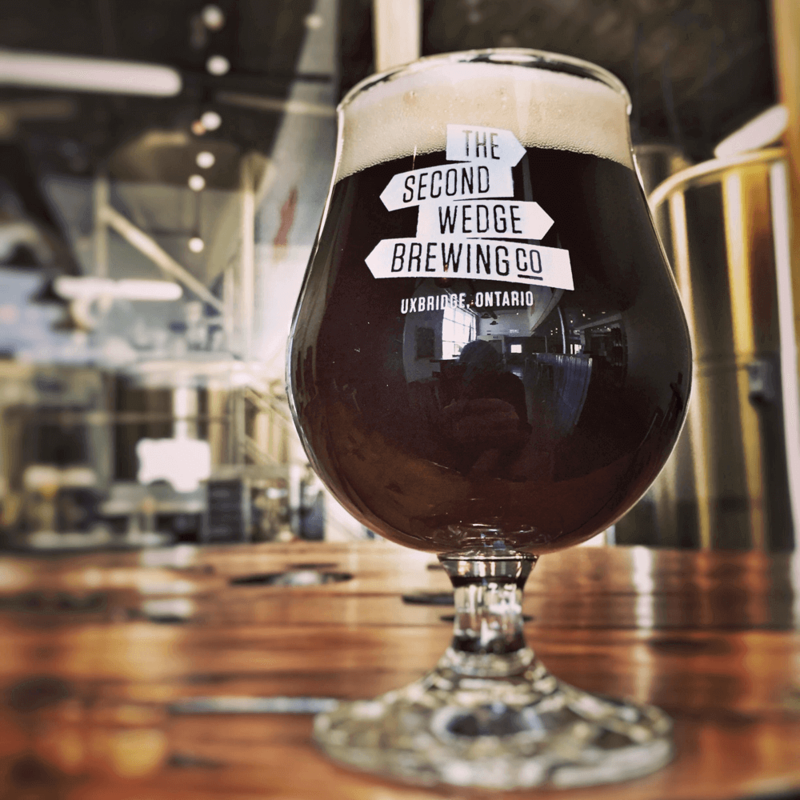 Cacao wheat ale | 5% alc./vol. 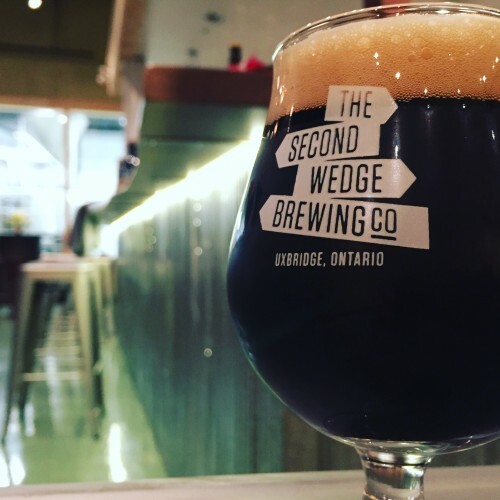 When two breweries have a new baby in common, the only proper way to honour them is with a beer collab! 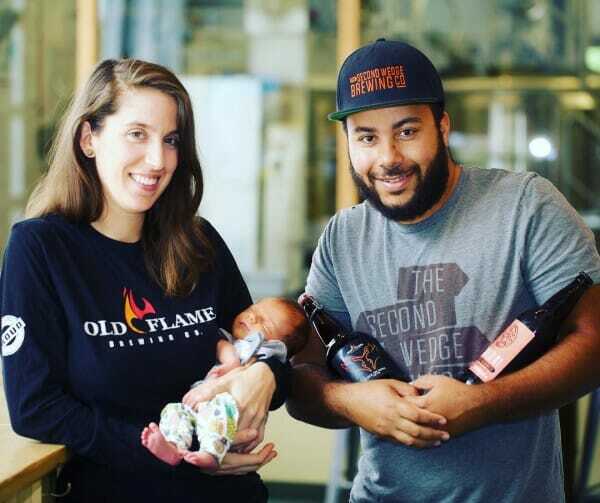 Zed, our sales rep, and Megan, @oldflamebrewery’s event coordinator, welcomed Birdelia over Labour Day weekend and now you can toast them with Love Child #1, a dark wheat ale married with 100% cacao emulsion from Uxbridge’s own @desbarreschocolates. Pale Ale | 4.5% alc./vol. An aromatic, balanced American pale brewed with all-Canadian ingredients: malt from Belleville’s Barn Owl Malt, hops from small Canadian growers, and yeast from Escarpment Labs in Guelph. Thirty cents from every can of Day Tripper sold will be donated to the Trans Canada Trail Foundation, in support of the connection and maintenance of The Great Trail.